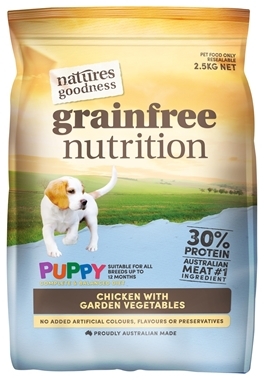 4 x 2.5kg bags of NEW Natures Goodness grainfree Puppy dry food. 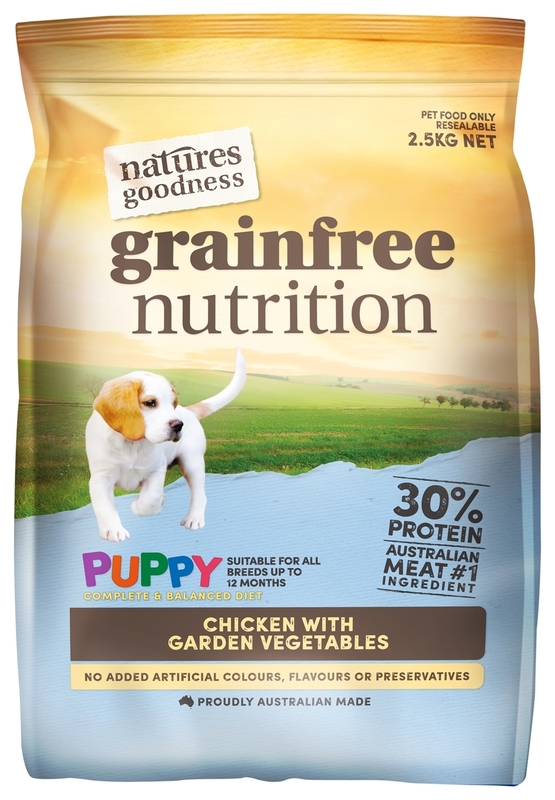 Natures Goodness grainfree dry food provides your puppy with a holistic food that is complete and balanced for puppies of any breed. All Natures Goodness grainfree dry foods are free from grains and fillers, high in protein and have no artificial colours, flavours or preservatives. Meat is the #1 ingredient in all Natures Goodness grainfree products. Meat and meat by-products (poulty and beef) and/or poultry by-products, vegetables and vegetable meals, tapioca and/or potato starches, poultry fat stabilised with natural mixed tocopherols (source of vitamin E), beet pulp, poultry digest, essential vitamins and minerals, whole oil seeds (linseed and/or canola), salt, potassium chloride, choline chloride, chicory root inulin, marine micro algae, natural antioxidants, yucca, egg powder. This may need to be adjusted depending on the breed, age, activity level and lifestyle of the dog. Always feed in a clean bowl and ensure that your puppy has fresh, clean water available at all times.